Don't these stumps just look like somewhere fairies would live? Heather and I thought so! 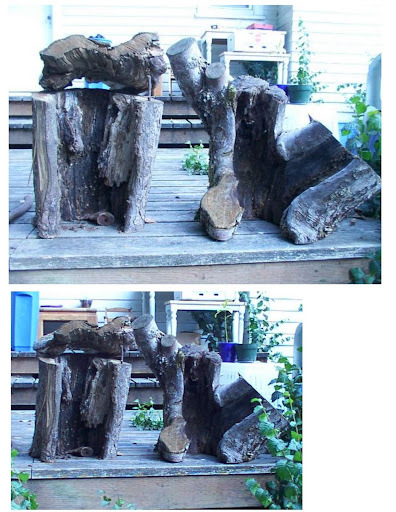 :) Her dad is a master woodworker, and so we asked him how to make these beautiful stumps into doll houses for our kids for Christmas. He made Heather's kid's for her and he helped me clean mine out and get it ready to put onto the base. I used poplar for the rooms and pine for the base. The poplar has a bit of purple and green in it. It's SO pretty! I traded for a bunch of the stuff inside the houses from Bella Luna Toys.com.... the mama there was wonderful! The little mushrooms were off another site that I don't remember, but I just LOVE them. All ready for Christmas morning!